Dorel Sports’ revenue grew 6.6 percent in the third quarter to U.S.$219.1 million from U.S.$205.5 million, according to the financial report of its parent, Dorel Industries. Nine-month revenue was up U.S.$21.7 million, or 3.5 percent, to U.S.$650.3 million compared to US$628.6 million a year ago. Organic revenue grew approximately 11.8% for the quarter and 3.9% year-to-date, after excluding the impact of varying foreign exchange rates year-over-year and the divestment of the performance apparel line of business (SUGOI) in the second quarter of 2018. Revenue grew approximately 11.8 percent for the quarter and 3.9 percent year-to-date, after excluding the impact of varying foreign exchange rates year-over-year and the divestment of the performance apparel line of business (SUGOI) in the second quarter of 2018. Cycling Sports Group delivered improved year-over-year results, due to several factors. The U.S. independent bike dealers channel had a solid third quarter finish on the heels of strong momentum created at the annual August sales meeting as dealers responded positively to the brand strategy outlined. As well, the divestiture of SUGOI, other cost cutting measures across all regions and previous restructuring efforts markedly reduced operating expenses. Pacific Cycle experienced a third quarter double-digit revenue increase as customers built inventory in advance of the busy holiday season. Other drivers included improved parts and accessories shipments, continued growth in Mongoose scooter sales and strong sales of battery powered ride-ons including the new innovative interactive Rideamals. Additional ride-ons introductions offset the earlier loss of the Toys“R”Us U.S. business. Caloi posted strong organic revenue growth in the quarter versus prior year, although declined in reported currency due to unfavorable foreign exchange. Organic revenue growth was driven by price increases implemented to offset rising inflationary costs and new product innovation. Brand mix and price points improved significantly versus prior year, however unfavorable foreign exchange and higher costs related to Caloi’s brand support resulted in a modest drop in operating profit. As a result of the segment improvements outlined above, third quarter operating profit increased to U.S.$7.0 million, up U.S.$6.8 million, from U.S.$0.2 million a year ago. Adjusted operating profit rose to U.S.$7.5 million, up U.S.$7.0 million. 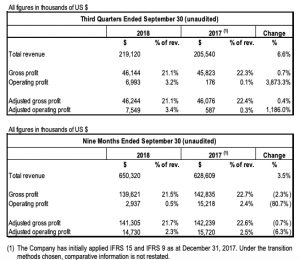 For the nine months, operating profit decreased to U.S.$2.9 million, down U.S.$12.3 million, from U.S.$15.2 million a year ago mainly due to the restructuring costs related to the divestment of the performance apparel line of business. Excluding restructuring and other costs, nine-month adjusted operating profit was U.S.$14.7 million compared to U.S.$15.7 million in 2017. 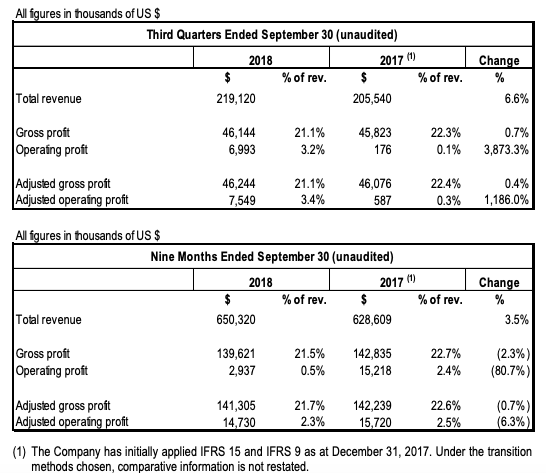 When excluding the U.S.$6.6 million impairment loss on trade accounts receivable from Toys“R”Us U.S. recorded in the first quarter of 2018, year-to-date adjusted operating profit increased to U.S.$21.3 million, up U.S.$5.6 million, from U.S.$15.7 million in 2017, mainly explained by higher revenue and reduced general and administrative expenses offset by the 90 basis points decrease in adjusted gross profit. 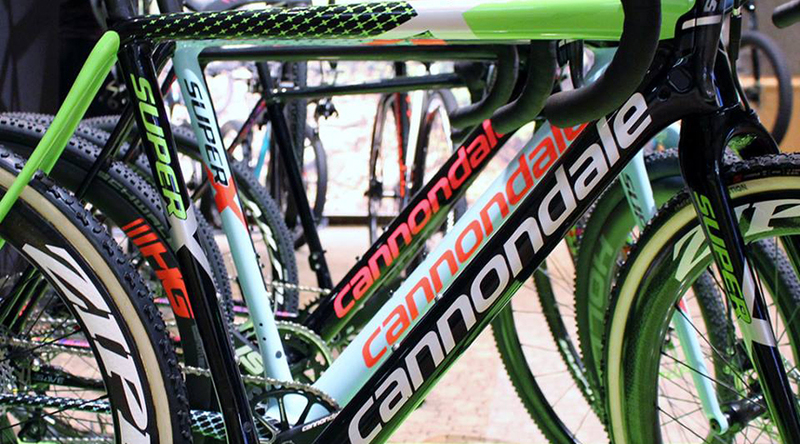 Dorel Sports’ brands include Cannondale, Schwinn, GT, Mongoose, Caloi and IronHorse.